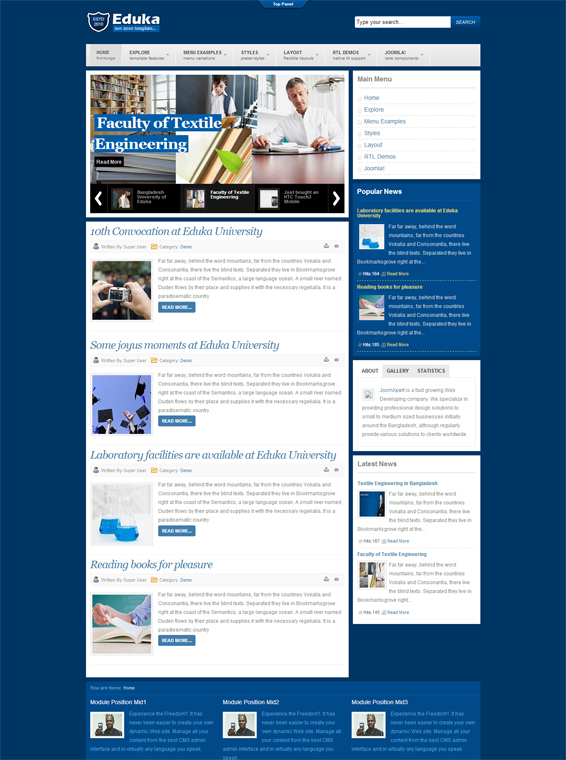 JS Eduka - stylish template from the studio JoomShaper on themes of education, having an attractive and unique design. This template has 4 built-in color schemes, support for component K2, 25 module positions and a built-in rotation materials Simple image gallery. Appearance of the template is designed so that you can create even a business card site, blog or portfolio. Sidebar is located so it is usually located on the engine, wordpress, that is right. Powerful mega menu makes it easy to organize categories and sections of the site, there are also additional checking out the panel, it can be placed almost anything, even an authorization form \ registration, survey or common link to friendly resources. Thanks slider and footer, you can store information in two levels, so you can bring even more useful information for visitors. The design of the pre-10 preset color schemes, there are 10 variations of modules and support for Google font, but in terms of the template code clean and optimized. Compatible with all modern browsers, CSS and PHP files are also optimized, all at the highest level.